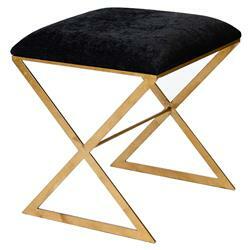 Sit back and relax in style with a glamorous gold ottoman. Mark your favorite spot with these X-shaped, polished legs, holding an opulent, chocolate brown velvet cushion. The slim silhouette and open base optimize small spaces with shimmering luxury.